What is DPC Watchdog Violation? Before diving right into the solution of this problem, it is essential that you understand what this issue is about and why it occurs, so that in future if you face the similar issue or come across the similar scenario, then you can probably find a solution using these steps. 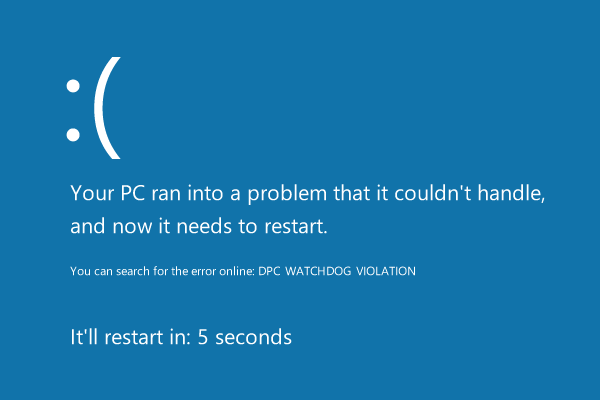 DPC watchdog violation is closely related to the blue screen of death error or bug which has a check value of 0x00000133. 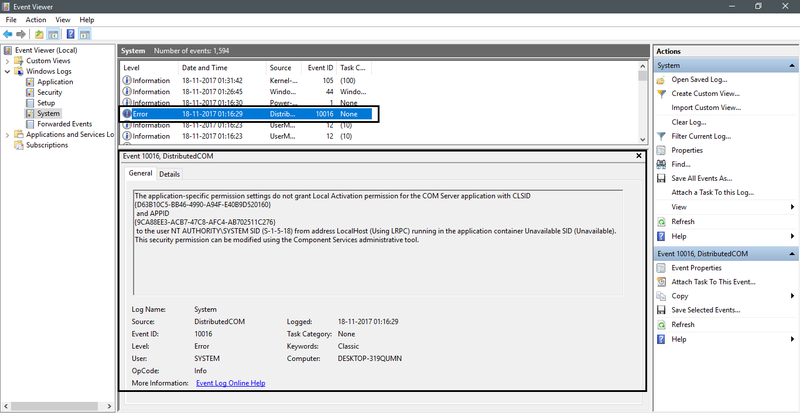 According to Official Microsoft Website, DPC refers to Deferred Procedure Call, and the watchdog relates to Bug checker which is monitoring all the windows processes and performances in the background. This error message is usually thrown when the bug checker is waiting too long, say more than 100 microseconds for a DPC response and when it cannot find it, it throws out an error. What are the major causes of this blue screen error message? There could be various reasons behind the appearance of the blue screen on the computer screen. Regardless of whether you’re using Windows 10 machine or a windows 8 machine, below mentioned reasons could be one of those significant possibilities of this. This is a possible reason for the blue screen of death to appear. So what happens is that, when you are trying to connect a hardware to your laptop or PC, but that hardware is not supported on your machine, then this screen pop-ups. The hardware connection could be as simple as an external hard drive or even the highest compatible NVIDIA or AMD Graphic card. 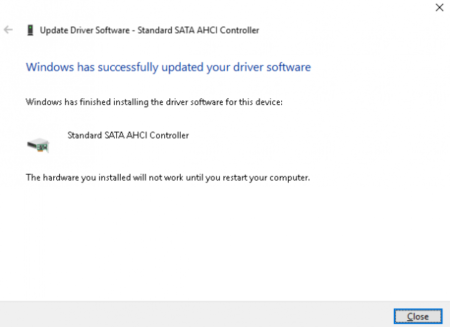 If you are not connecting any new hardware or if at all you are connecting a new hardware and then this typical blue screen pops up, then another reason behind that could be the “Not up to date drivers or firmware” of that particular device against your machine. So when you connect an external device for the first time or if you’re connecting it after few months, then there could be higher chance that this blue screen to appear may be because of not up to date drivers. Although this reason maybe not as usual as the above two, there could be a chance that this screen may appear due to a conflict between any two software’s. Suppose, you have a software X installed on your machine and now you’re trying to install Software Y. The software Y will get installed correctly, however, while using them, there could be conflicts between software X and software Y, and then the result is this “blue screen of death” error. These could be few possible reasons that may lead to this issue and remember the solution for this issue is very simple. Can we talk about the solutions then? Let’s get started then. If you can log in to the system and not facing the issue after that, it is advised for you to follow some of the below-mentioned instructions, such that the problem doesn’t occur redundantly. If you’re not able to login to the system, then try to power ON and OFF your system three times continuously and then log in to the system in safe mode. Also, if there are any external devices connected to your machine, then please remove them and keep it aside for a while until you finish the below-mentioned steps. 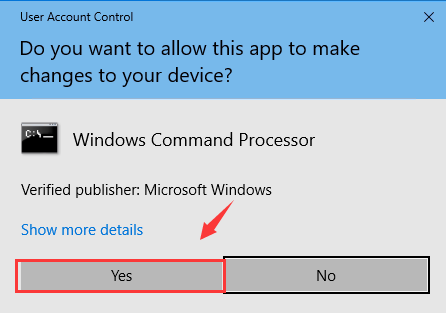 Please note that these steps can be followed for both Windows 10 and Windows 8.x machines. 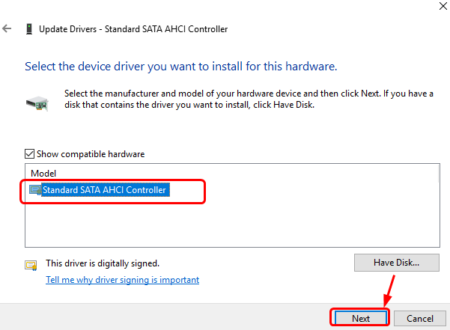 So basically this issue is related to the memory and storage device of your machine, and hence it is quite essential that you change the SATA AHCI Controller driver. 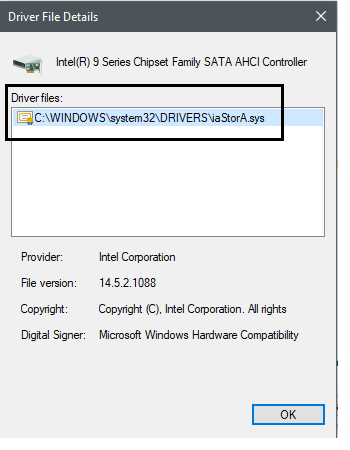 This driver is responsible for exchanging data between system memory and the storage devices. 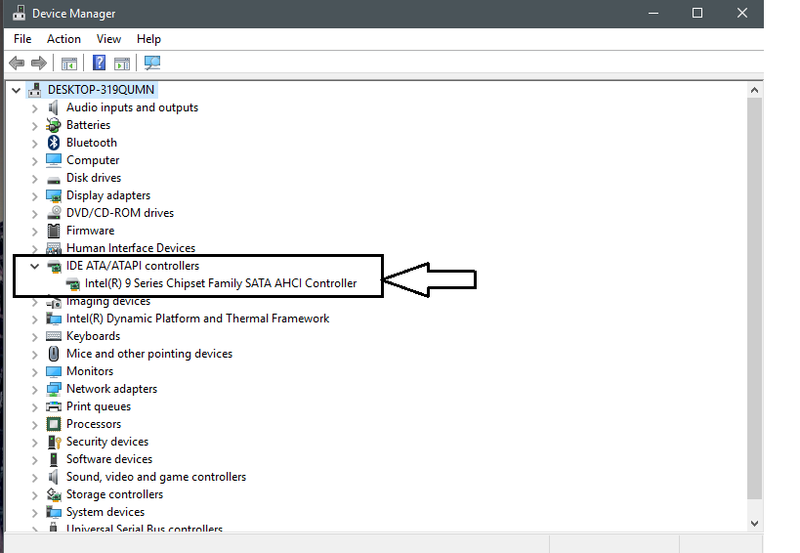 So when you connect to any storage device, this driver checks the compatibility and such system related stuff and gives the efficient output. So to resolve this issue, you need to change the SATA AHCI controller driver. 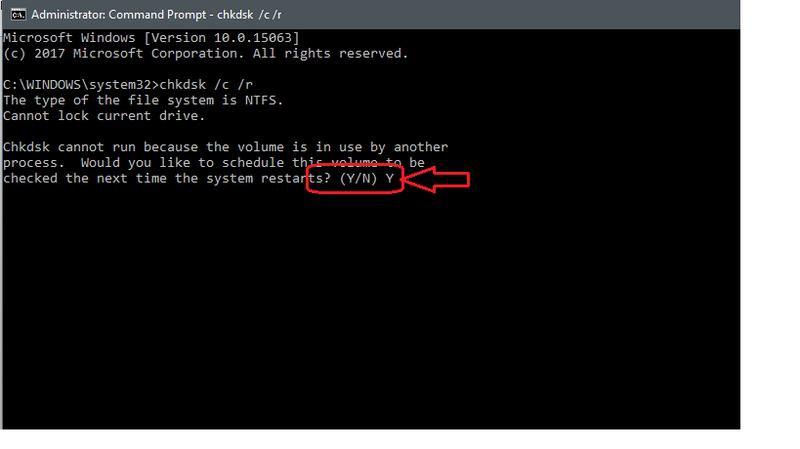 Step 7: Make sure it displays iAStorA.sys in the details. If not, then you can find the solution for the same in next. Step 9: It will ask you to select from two options which are like checking an update online or selecting from your system. 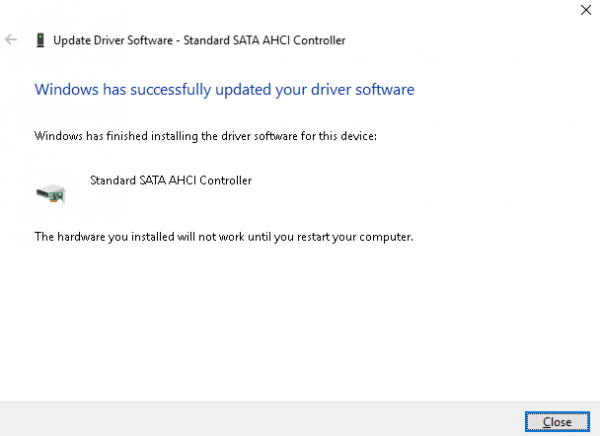 Step 11: Finally, after successfully updating the driver, it will show you a message asking you to restart the machine to successfully complete the installation. So please restart the machine and hopefully, you should not face the issue again. 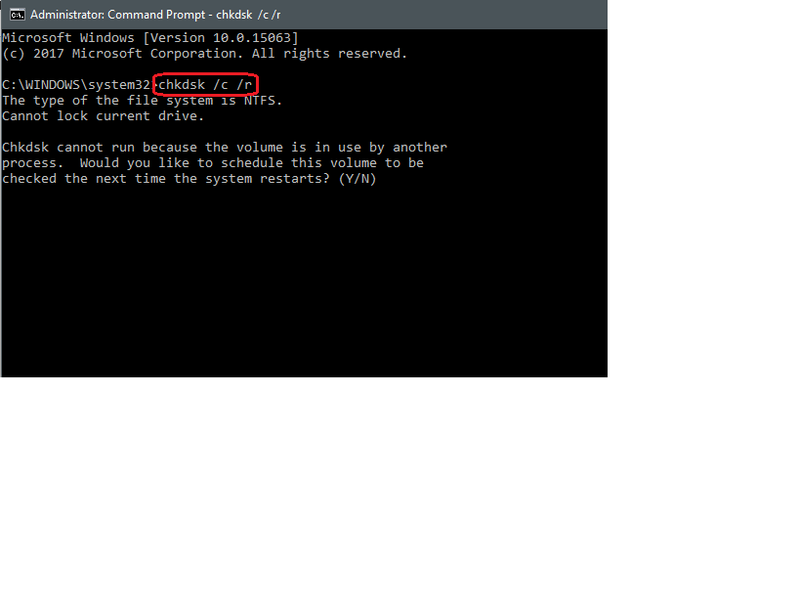 Also, remember that this procedure needs to be followed again if your windows get updated. However, this is a simple solution and don’t have to bang your head every time you face this issue. Remember in Step 7 we mentioned that it should display iAStorA.sys file. 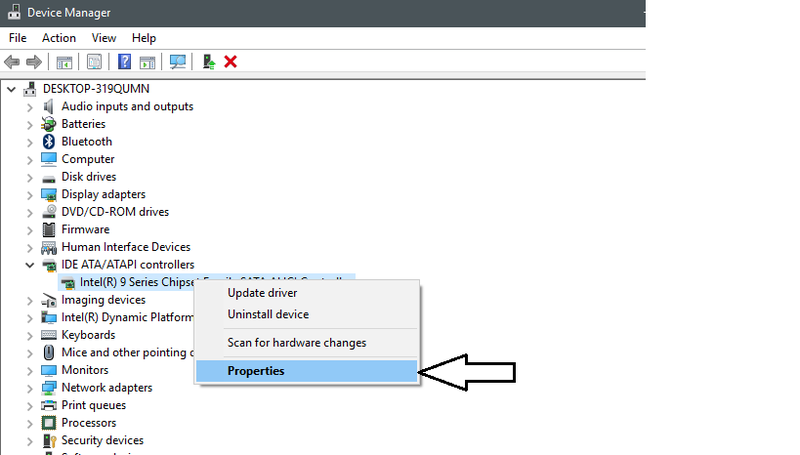 Unfortunately, if you see the storachi.sys file listed in the properties then you have to update all the drivers existing on your machine. 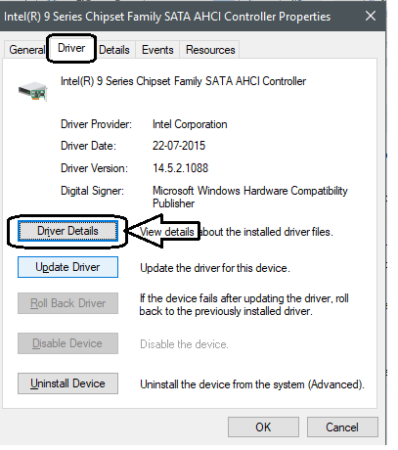 You can update all your existing drivers with the help of pre-loaded applications from OEMs like HP Assistant from HP or you can also download an easy freeware called Drivereasy which is a tool to update all the drivers in your machine. Most often we purchase an external device hoping that we should just plug in the device and get going on whatever work we were supposed to do and most of the times it work, however, in some ugly scenarios, it doesn’t work. The hard drive or the external USB which you purchased with utmost excitement, fails your expectations by showing up the errors like this. Worry not, there is one simple solution which will enable you to identify the hardware and software conflicts with your machine. Apparently, the solution is easy and the best means to find out the hardware compatibility is by doing a trial check. If you’re trying to connect multiple devices at a time and are oblivious on which device has caused this issue, then unplug it one after another, restart the machine and check if you’re still facing the issue. By this means, you will able to identify which device is giving you the trouble. Ultimately by finding out the culprit, you can check the device specifications or user manual which will tell you whether the device is compatible with your machine’s operating system or not. If not, you can wish to exchange the device from where you’ve purchased. As I explained earlier, there could be software conflicts that could lead to the occurrence of Blue screen of death error. If you already know that what software you’ve installed lately and suspect that this software could be an issue, then as similar to hardware compatibility check you can uninstall that particular application, restart the machine and check for a while if still the issue persists. If not, then you’re good to go. Also, if you are unable to determine which software you’ve installed most recently then follow these simple steps to find out that. 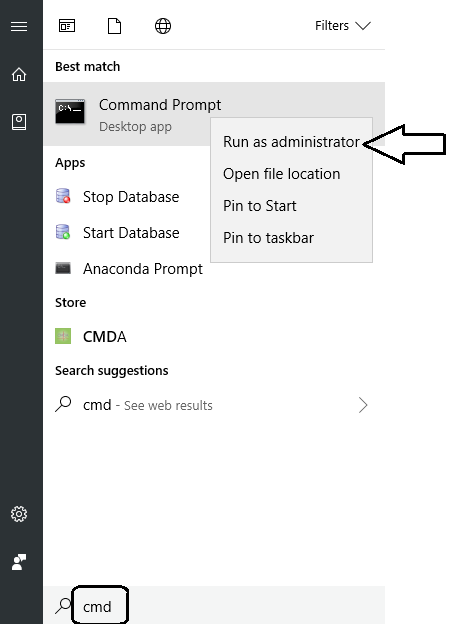 Step 4: This will display your list of all applications that are installed on your machine apart from the windows store. 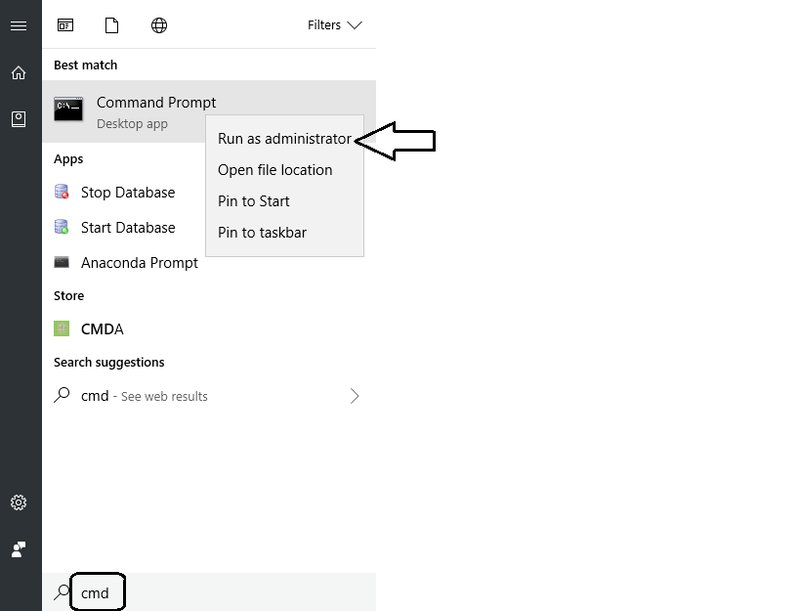 Step 6: This will sort down the programs based on the time at which it was installed and from those programs you can uninstall the programs which you suspect. 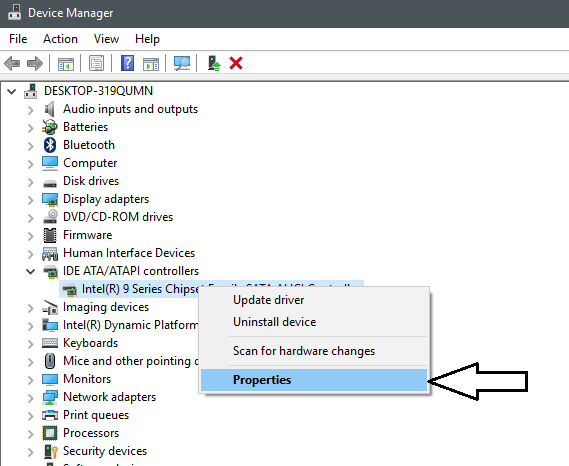 After uninstalling the programs, try to use the machine after a restart for a while, if still the issue persists then continue the below troubleshooting steps. Now the steps which we are going to perform should not be needed if the above steps have resolved your issue. However, we will explain you these steps so that you can perform in case your issue is still not resolved. Please stand with me as these steps may sound little geeky! The main purpose of running a disk check is to identify whether the disk is in proper condition or not. Since the blue screen of death is usually tagged with the memory or storage device. Below steps will help you to perform a disk check. Please be aware of the fact that disk check will take many hours to complete, so make sure that you don’t have that busy schedules or meeting lined up before you perform this check. 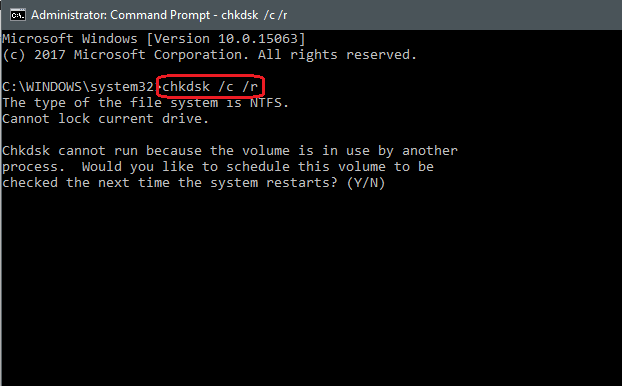 Step 1: Press the windows key and type cmd which will display you the command prompt application. So the system will reboot and the disk check will start after that. Once the disk check is completed, you will see the status of the drive that will help you analyze the issue further. Now performing this step will not actually help you to resolve your blue screen of death issue, however, this step will help you to determine which driver or device in your system might be causing the actual conflict. 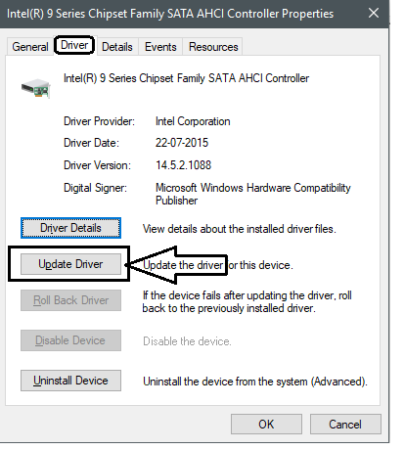 With this, you can easily update that driver or resolve the issue with that device. 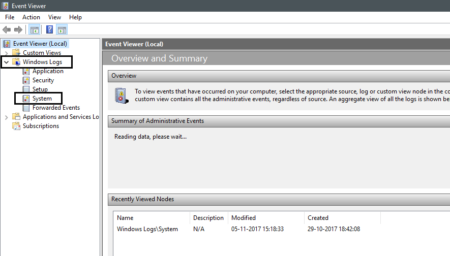 Follow these simple steps to run event viewer on your Windows machine. Step 5: Now from the list of displayed information, scroll down to find out the options which are highlighted in red exclamation icon detailing you as the errors. 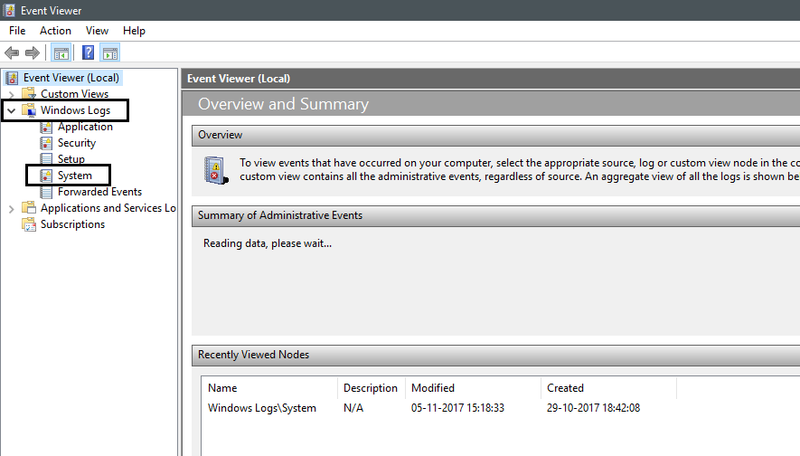 Step 6: Click on the icon and it will list down the details regarding those errors. Based on the results displayed, you can fix them by updating the drivers or work with the devices corresponding to those errors. So by following these little to less complicated steps, you should be able to resolve the blue screen error issue. Did these steps work for you? Let us know in the comments section below.